These places have shown care to the menu with its consistent quality of food that made my palate dance long after the plates were taken away, beautiful decor and outstanding service. I’ve been there for lunch and dinner on different restaurant weeks and the food is always excellent. Things that stood out were fish and scallops, cooked to perfection and matched with fresh seasonal ingredients. 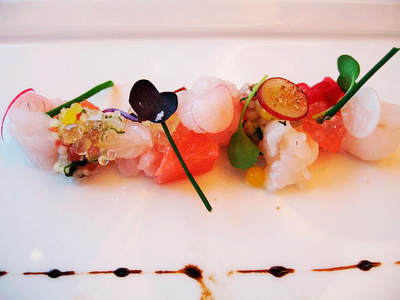 The Fish Crudo was excellent with citrus fruit, citrus tapioca pearls and a light balsamic. Fresh bites of really fresh fish, slightly dressed, with bursts of fresh citrus flavor. For entree you can’t go wrong with Diver Sea Scallops with shiitake, turnips and barley. I’ve also had excellent Sea Bass and Chestnut Pappardelle during my other visits. 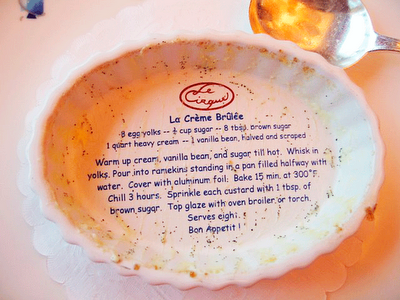 Le Cirque is my first choice because you never come out disappointed, whatever you order is always flavorful and best of all, you can end your meal with their signature Creme Brulee with vanilla beans, you can see the beans as your eating and the treat is at the bottom of the porcelain bowl, the recipe printed there. Although other desserts are not too shabby either. If you go with friends, make sure u order different ones to share. And it doesn’t hurt that there’s always celebrity sightings! I hear they are going to have a $45 pre-fix on their menu after restaurant week, which is still a steal. 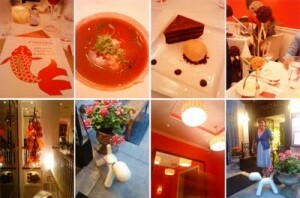 I was there last night and believe it or not, it was so good, it actually made me return to writting this food diary. The Chef Gabriel Kreuther is a James Beard Award winner, enough said. Being part of the Moma Museum, the decor is very chic and modern. We sat at the bar dinning area, where tables of 4 max were offered. If you sit in the main dining room you would have a view of the Sculpture Garden. Service was super attentive and friendly, and i was able to get seated before my 3 friends arrived, instead of fighting for a spot at the crowded bar. There were so many good choices on the menu, made it hard for my indecisive nature. For my appetizer i had the Tarte Flambee, an artesanal thin crust tart with creme fraiche, onions and applewood smoked bacon. It was light and crunchy, creamy and aromatic. I can’t lie, anything with bacon is a winner for me. And with the rest of the dishes being on the small side, this was a 12″ pie! good enough to share. My friend had the Roasted duck breast with peppercorn-crusted apples, crunchy, sweet and savory dipped in the pistachio-truffle sauce was a winner as well. For our main course, my friend had the Beer-Braised Pork Belly which won a good “hmmmm” from us tasters, but nothing beat the looong “hmmmmm hmmmmm hmmmm sooo good” remarks the Gaeta Olive Crusted Quail!!! got, notice how there’s exclamations!!! it was the best quail i’ve tasted. We were afraid it would be a little gamey tasting, but it wasn’t at all. The chorizo, barley, toasted almonds and pickled pearl onions sauce was savory, crunchy, chewy and spicy, and it all worked together like a good symphony. Every bite was different and an explosion of flavors and texture in my mouth. The quail was cooked just right, it had a little crust from the olive, golden brown and the meat was tender and juicy, the portion was about 2 whole thighs, not a lot to cover someone with a big appetite, but I was fully satisfied after the meal. To end the night I had the Pistachio Dark Chocolate Dome, rich dark chocolate, with pistachios, ice cream and amaretto gelee. The gelee i didn’t really care for, it was so tiny and I could barely taste it, but the rest… I was licking my spoon … well sorta… hey, life is always sweeter with dessert right? This wasn’t just a feast for our palette but also for our eyes, all the utensils and plates, the plating, every detailed is nicely designed. After dinner we all agreed, we would definitely come back another time, I would go just for the Quail and I would pay full price (which really isn’t too bad considering the level of yummyness). His restaurants have a very chic homey feeling, modern yet warm and relatable. Little design details here and there that I really appreciate. To be honest I wanted to go because of the Cheesecake lollipops (more on that later), but i came out impressed with the rest of my meal. I started out with Pretzel Crusted Crabcake & Sweet Chili Prawn it was a bit sweet with a hint of tartness, the pretzel crust is crunchy salty and a little of an unexpected surprise, i cleaned my plate. It was followed by Handmade Cavatelli & Braised Short Ribs, with wild mushrooms and truffle mousse. I’m a carnivore, so i know my meat and this was tender, flavorful, and had lovely earthy tones, the al dente pasta was a nice side to have. As promised, my sweet moment came in the form of Cheesecake lollipops there was raspberries and bubble gum whipped cream to accompany the 3 different kinds, strawberry, oreo and dark chocolate. It was an additional $10, but if you’ve never had them, it’s a really nice treat, specially the tree presentation. The other desserts were quite lovely as well. These restaurants were also very very good, had nice decor and great service, but it just didn’t make top 3… if i had a top 10, they would definitely make it. Another one of DB with great clean, modern design. The koi fish concept is so beautiful and inviting. There’s a little white dog tied outside, and a bench. Very homey indeed. The sea theme is seen throughout the 2 level dinning room. My gazpacho with blue crab was good and refreshing but I wasn’t blown away, and same goes for the chocolate, dulce de leche dessert. But the Sautee Skate Wing was perfection on a plate. Golden brown, the fish was moist and tender. The caper relish gave if a salty and tart kick. I didn’t care for the baby greens, but the fish was divine. Best skate wing this chubby had to date, and the portions were good too. I’m mentioning it because it’s named one of the most romantic restaurants in NYC. I went there on a date with my ex bf and we had a great time. The ambiance is as they say very romantic. There’s a piano delivering soft tunes, candle light and roses on every table. It was a while back so I don’t remember what I had exactly, but the food was quite good, vaguely recall having fish and steak which i enjoyed and chocolate dessert. It was a good night that ended with a sweet kiss. I usually don’t write about bad places, since I try to forget about the awful way I wasted my precious daily calories. But since i’m mentioning the best of restaurant week, I thought it would only be fair to contrast it with the ones that just jumped on the wagon of restaurant week, but didn’t really care about the quality. Location, location, location, it if wasn’t for the beautiful setting, i wouldn’t have even bothered. The restaurant week menu seemed like a joke. The bread was good and maybe the dessert was half decent, but the food was a total disaster. The fish was overcooked, super dry and flavorless. 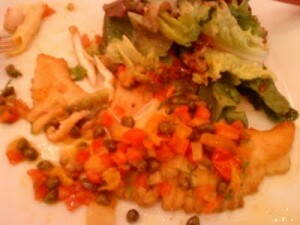 It was a white piece of fish on a plate with some vegetables. I had high expectations for this place and neither my dishes or my date’s were good. Hip and contemporary japanese. It wasn’t that the food was bad. It was all very tasty, maybe because food took forever to come and we were very very hungry by then. The crispy shrimp and salmon maki was good and so was the Petite Filet Mignon with uni butter, but his was truly petite. I mean, I know this is a pre-fix and all but I have a bigger appetite than a size negative zero model, so if it’s dinner time I need food! The dessert came in a giant bowl with very little content as well. So overall it just wasn’t a good value, and these are tough times. $35 dollars can get you alot more elsewhere. I love that you're back! Congrats on starting to blog again. Your reviews are great. Very informative and so well written. 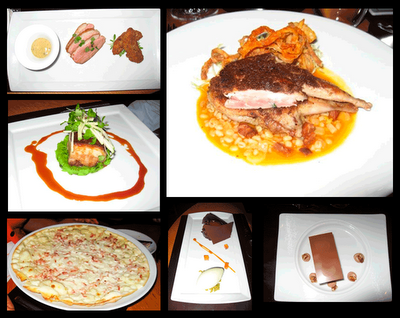 I went to a Foodbuzz event at the David Burke Townhouse and it was fantastic. You've reminded me that I want to go back.